Pink Sugar by O. Douglas ~ 1924. This edition: Hodder and Stoughton, 1936. Hardcover. 312 pages. A rather sweet book, but not mawkishly so in the way the title suggests. I wasn’t sure what to expect from this one, but I came away feeling beautifully contented, in an “all’s right in that fictional world” sort of way. The heroine sorted herself out nicely, and we have high hopes for her future if she can just retain that hard-won sensibility to the absurdity of playing Lady Bountiful to an oblivious populace! I guess I should backtrack a bit, and summarize the plot for those of you not already familiar with this gentle novel. “Spinster without encumbrances” Kirsty Gilmour is thirty and a free woman for the first time in her life, after the recent death of her stepmother, a woman described as “sweet and friendly and quite intolerable”. The second Lady Gilmour was an absolutely selfish creature whom Kirsty has stuck with from charitable impulse and deep inner goodness – Kirsty is the inheritor of her late father’s fortune, and has financially supported and accompanied her stepmother through that woman’s preferred social whirl in the years since Sir Gilmour’s death. Kirsty’s older friend, Blanche Cunningham, reminisces about the unregretted Lady Gilmour. Kirsty sat looking in front of her. ‘She’s dead,’ was all she said. Now, freed of the superficial social whirl, Kirsty has joyously fled to the country, her true emotional habitat and the place of her birth, to the Borders of Scotland, to the little village of Muirburn, just outside of Priorsford. (O. Douglas aficionados will recognize the reference.) Here she has rented a house, “Little Phantasy”, on the grounds of a larger estate. The manor house itself, rather quaintly named “Phantasy”, is the abode of curmudgeonly bachelor Colonel Home, forty-ish and set in his ways, by all accounts. Kirsty doesn’t expect to see much of him, and is rather glad of that. Kirsty has decided that she will now embrace the country life, and that she will devote herself, in true “good spinsterish” fashion, to “living for others”. Sensible Blanche rolls her eyes at this, and tells Kirsty not to be silly, but Kirsty means this in the very best way, taking under her wing as soon as possible a number of dependents. First comes elderly Aunt Fanny, mild and gentle and perpetually knitting, and then the three motherless children of Blanche’s sister, for an extended rural stay while their recently widowed father travels abroad “to forget his grief”. Kirsty’s foray into country life is not as smooth as anticipated, and she soon finds that people don’t necessarily like to be “lived for”; some of her most well-meant patronages are soundly snubbed, but there is enough encouragement that she soldiers on. Her tenacity and truly well-meaning sweet nature win over the most resentful of those around her. Kirsty was initially viewed as a frivolous bit of a thing, merely playing at enjoying her new role as householder and surrogate mother to the adorable Barbara and Specky, and the wickedly appealing “Bad” Bill, but as the months go by it is apparent that Kirsty’s innate inner goodness and staunch Scottish good sense will see her settled down and competently filling an important niche in Muirburn society, though not the role that she initially saw herself in. Pink Sugar was republished by Greyladies in 2009, and though that edition appears to be currently out of print, it should still be fairly easy to acquire through the second hand book trade. The novel was very popular in its day – my own copy is a vintage 1936 edition, stating that it is the twenty-first printing – so there are many still circulating around at reasonable prices. Thank you for the link! Your opening paragraph is spot on, and sums it up beautifully. It was a lovely, happy, feel-good read, with some wonderful characterisations. This sounds delightful, thanks for your review. I may have to track a copy down. Spot on, as always. This isn’t my favourite O. Douglas novel but it is still a very sweet diversion (without being as sickeningly sweet as the title suggests). I greatly enjoyed this one. I’m still trying to identify my favourite, though. The Proper Place, I think. Though I’ve just read Eliza for Common and I thought that one was interesting too. A thought it was really more about Eliza’s mother; she is the one we really get to know the best, and I thought that the depiction of the mother-daughter relationship – deep love mixed with resentment and petty annoyance at times – was very well depicted. Thanks for linking to my blog. 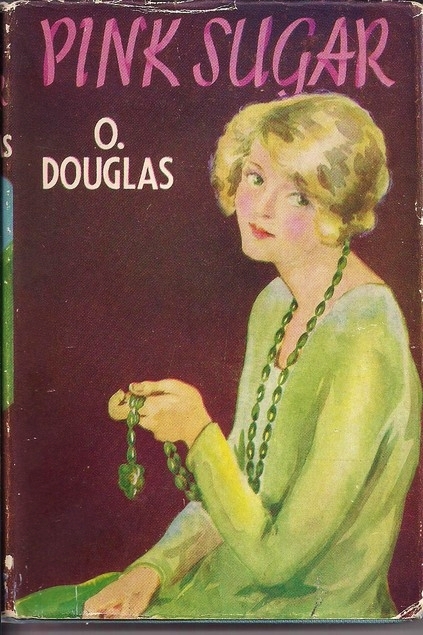 I love O Douglas & I’m so pleased Greyladies reprinted some of her novels. I’m a great fan of Scottish domestic fiction of that period. I like the sound of this very much, especially the character of Lady Gilmour, ‘sweet and friendly and quite intolerable’. There do seem to be a lot of novels in this period about women of a certain age (30!) suddenly becoming free of family responsibilities – things like Lolly Willowes, or Father by Elizabeth von Arnim. Was ‘being free’ a common fantasy, I wonder? I wonder… There did seem to be a societal expectation that at least one of the children of a family – and yes, it would have often been a daughter – was expected to forgo marriage and care for aging parents… so yes, I think this would have been a common fantasy, the “What would I do if I were free?” speculation followed up in fiction. I am sure it struck a chord. Yes, a legacy would improve matters no end! I’d never heard of O. Douglas until reading your reviews. I’m very excited to have found a reasonably priced copy of The House that is our Own at Amazon.UK. Someone was selling Pink Sugar as well, but wouldn’t ship to the US. I’ll try again later, but I’m looking forward to reading this author.